Blogging about blogging. I’ll try to do it very little. This is why spammers are paying people to solve captchas, which makes spam less than free. Making it difficult to spam, is good for us. 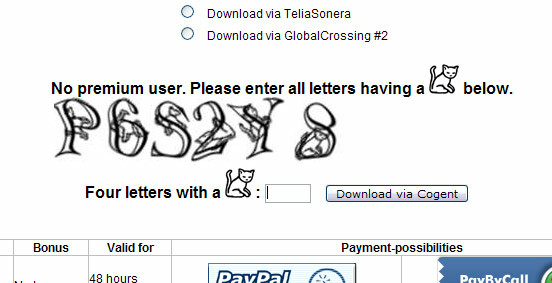 They pay a few cents for each captcha solved, and this puts a cap on the profit they can get. And in some regions of the world, a few cents can get you a long way. Captchas help develop the economy. Heck, Amazon has an entire business built around this idea. The Amazon Mechanical Turk. The original Mechanical Turk was a clever hoax. It was a machine built in 1770 that supposedly knew how to play chess. In fact, there was a midget chess master hiding inside the machine. reCaptcha solves OCR mistakes by showing you two words in each captcha. One word is a known word, and is the test word. The other is a word that the OCR has failed to understand. When you answer the reCaptcha, you verify that you are a human being (kudos!) AND you help preserving the worlds knowledge in digital form. Why am I using reCapthca? I use reCaptcha because I hate talking to spambots and I love having conversations with human beings. I want your comment to be worth more than the two seconds it takes to pass the test. This way we can have a meaningful relationship. Oh, and you can always register with OpenId. That’s good enough for me.